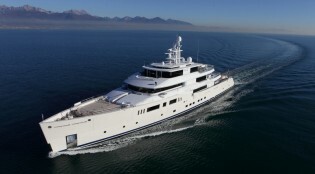 73m mega yacht GRACE E to cruise the waters of the Caribbean this winter – Superyachts News, Luxury Yachts, Charter & Yachts for Sale. Superyacht Grace E was successfully launched at the 2014 Monaco Yacht Show, where she was greatly appreciated by 180 qualified private visitors who admired her good looks and stunning lines. The verdict was unanimous from this group comprised of yacht owners, members of the yachting industry and media: this haven of well-being and elegant combined with the famous Vitruvius hull, is a huge success! An Award winner from the start, Grace E yacht was recognized for ‘Best Interior Design’ for her interior by Remi Tessier.